An annual tradition, this display is probably the largest in all of southern Saratoga County. Spanning more than 1,000 feet of Route 9, Quick Response is home to dinosaurs, mischievous elves, Santa and his reindeer, plus a number of other scenes. 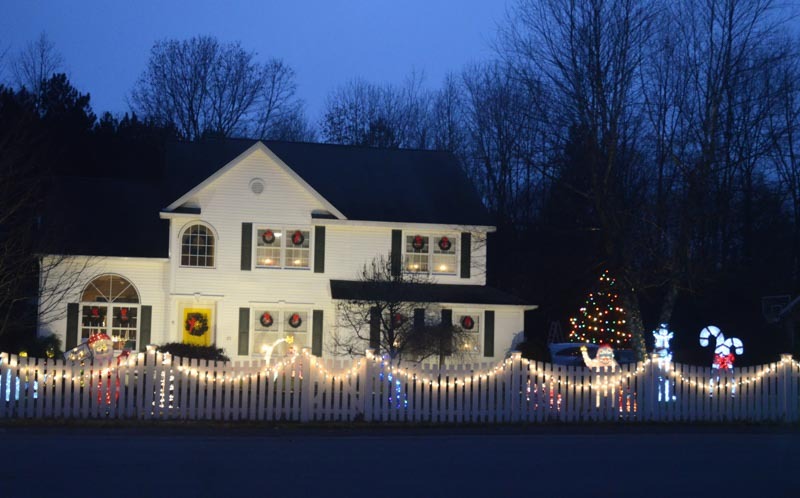 Viewing Tip: From Exit 11 of the Northway (I-87), head east toward Route 9 to pass through the Village of Round Lake to light displays on historic homes. Once you've passed through the village, turn right to head south on Route 9 to Quick Response. Many years, you can see lights reflecting on the lake. This massive neighborhood is a great spot for a slow roll. You'll find plenty of lights plus lots of fun blow-up characters. For the densest concentration of lights, be sure to turn down Blue Spruce Lane which runs along the popular hiking destination, North Woods Nature Preserve. Viewing Tip: Due to sheer size of Country Knolls, you may need help from your GPS. Navigate to the nearby Stewart's, located at 13 Longkill Road, and end the night sipping hot cocoa. These neighborhoods link together to form a great loop for Christmas light viewing. Start your drive on Torrey Pines (accessible from Main Street and Carlton Road) where you'll find the display pictured. From Torrey Pines, turn onto Spruce Court or Pinehurst Drive to continue through the neighborhood. Viewing Tip: Heritage Green starts from Main Street, and turns into Country Knolls West at Pebble Drive and Pinehurst Drive. You may also enter the neighborhood from Van Patten Drive at Lacosta Drive and Greensboro Boulevard. For a small development, Knolltop packs a lot of punch with decorations. A quick loop around the neighborhood will take under 10 minutes at a slow pace, so this one is great if you're strapped for time. Sitterly Road sees a lot of traffic, but Deer Run Hollow is a fairly quiet neighborhood. Displays in this neighborhood scream classic Christmas with lots of warm white lights and deer statues. Viewing Tip: This neighborhood can also be accessed from Woodin Road. To get to Cindy Lane, you'll need to take Windsor Drive or connect by taking Cambridge Drive to Kasper Drive and turning left onto Deer Run Hollow. Clifton Knolls is another large neighborhood with plenty of dazzling lights. With plenty to explore, route options include exiting onto Clifton Park Center Road, Vischer Ferry Road, Grooms Road, and Moe Road. Viewing Tip: Hit the playground on South Barney Road if your little ones need to burn some energy before settling in for the ride. Didn't see your neighborhood? Share photos of your favorite lights and decorations on our Facebook Page!